179 JANSSONIUS, J. Terra Firma et Novum regnum Granatense et Propayan. Amsterdam, after 1630. In original o/l colours. Generally in very good condition. With some contemporary manuscript annotations in brown ink. 371 x 485 mm. Je voudrais de plus amples renseignements sur le Lot N°32399 . 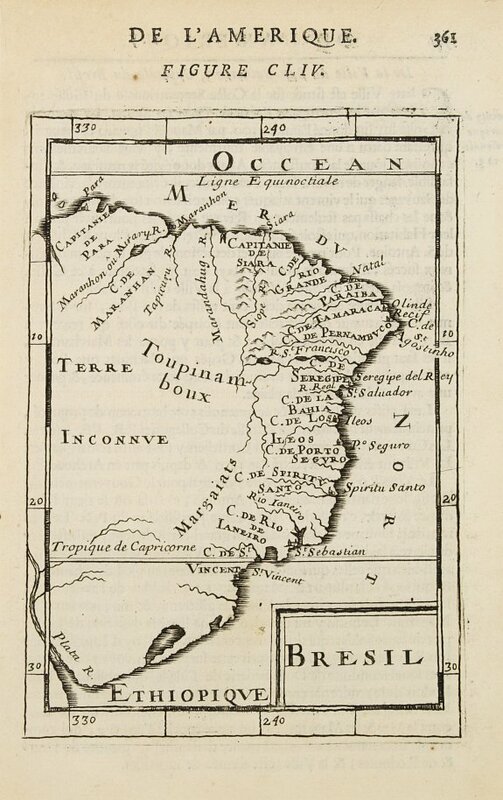 ¤ Fine copy, with wide margins of this handsome map of the Isthmus of Panama and northwestern South America including most of present day Columbia and part of Venezuela. Terra Firma is Panama, Veragua is Costa Rica, and Popayan in the west and Nuevo Rey Node Granada in the east refers to the mountainous Columbia. The map is significant both for illustrating these early historic areas in the New World and for the numerous settlements, rivers and mountains. 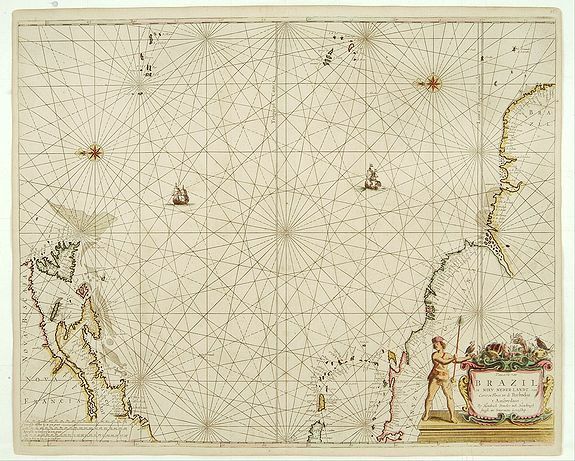 The map is based on the cartography of Hessel Gerritsz. No text on verso. From a French composite atlas. V.d. Krogt, Atlantes Neerlandici, Vol. I, 9810:1. 180 SANSON, N. Amerique Meridionale. . . Paris, P. Mariette, 1667. In original o/l colours. Paper slightly age toned. Some very light marginal water staining spotting. 200 x 275 mm. Je voudrais de plus amples renseignements sur le Lot N°25207 . 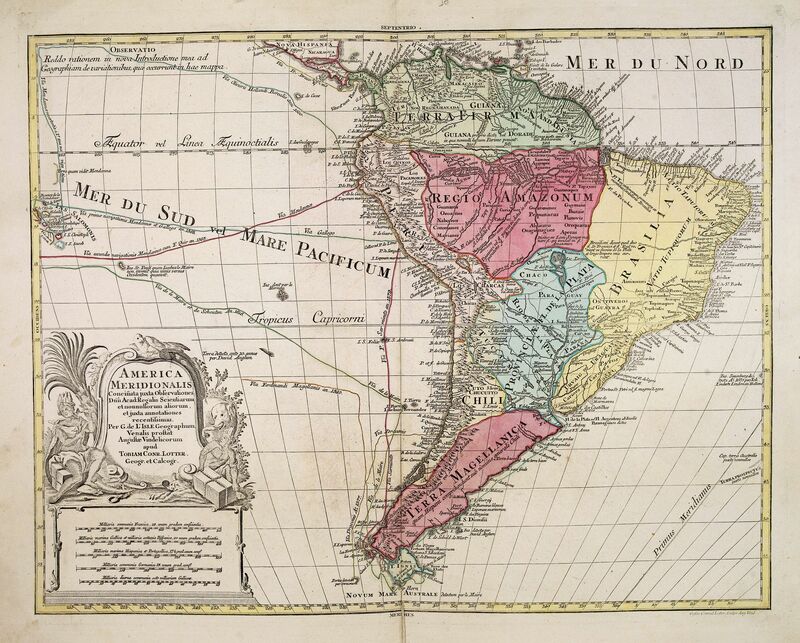 ¤ Map of South America prepared by N.Sanson and published by Pierre Mariette. Published in an early edition of the small Sanson atlas L'Europe Dediée a Monseigneur . . . Le Tellier Secret. D'Estat &c."The atlas proved popular and the maps were imitated by Johann Zunners in Frankfurt (1679) and by Joannes Ribbius and François Halma (1682-1730s). The map offered here is the first plate. Engraved by A.Peyrounin. 181 LE ROUGE, G.L. L'Amerique méridionale. Paris, 1746. Limites en col. d'époque. Very good condition. 204 x 274 mm. Je voudrais de plus amples renseignements sur le Lot N°25443 . ¤ Interesting map of South America. 182 LOTTER, T.C. America Meridionalis. Augsburg, 1772. Coloured. Paper age toned, spotted and with surface dirt. Water stain in upper right corner. With an uncoloured title cartouche as issued. 455 x 576 mm. Je voudrais de plus amples renseignements sur le Lot N°32723 . ¤ A handsome detailed map with a large title piece at bottom left is surrounded by natives, a bird and a elephant. 183 VAUGONDY, R. / DELAMARCHE. Paraguay, Chili, Terre Magellan. Paris, 1794 -1806. Coloured. Good and strong impression on solid paper. Some very light marginal spotting. With some later colour addition in landmasses. Else very good condition. 242 x 220 mm. Je voudrais de plus amples renseignements sur le Lot N°25686 . 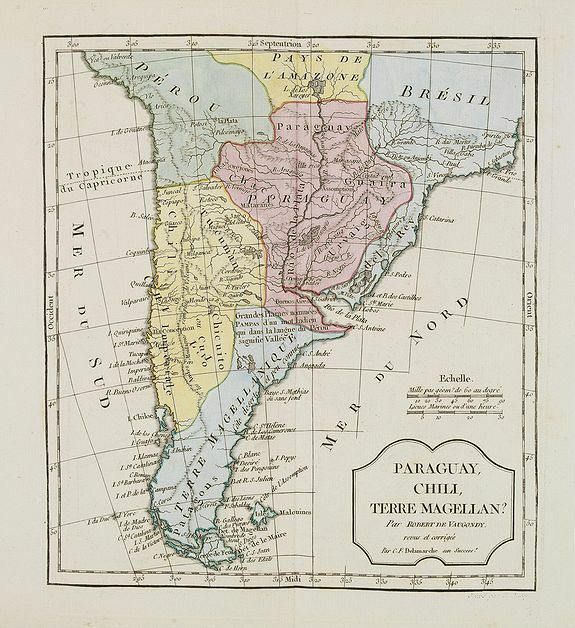 ¤ Map of Paraguay, Chili, and Argentina . 184 VUILLEMIN, A. Nouvelle carte Illustrée de l'Amérique du Sud . . Paris, Fatout, 1860. In original o/l colours. Steel engraved map, a good and dark impression. Paper very slightly spotted and age toned. Repair of lower part center fold 8cm. Into engraved area. Very good. 600 x 845 mm. Je voudrais de plus amples renseignements sur le Lot N°25934 . 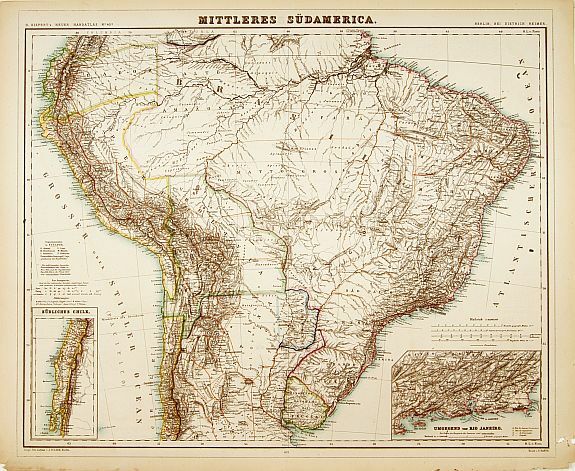 ¤ A most decorative mid 19th century map, in left and right part 12 vignettes giving a wealth of statistic and commercial information of each region in South America. Also two botanical vignettes in the lower corners. With a colour key . In lower right corner an inset of the Western hemisphere, with all major steam vessel lines around and to the continent.. The text is engraved in steel by Gérin, and the map by F.Lefévre. The illustrations are after a design by A.Testard and are engraved by Guesnu. 185 KIEPERT,H. Mittleres Südamerica. Berlin, 1872. In original o/l colours. In good condition. 450 x 543 mm. Je voudrais de plus amples renseignements sur le Lot N°12340 . 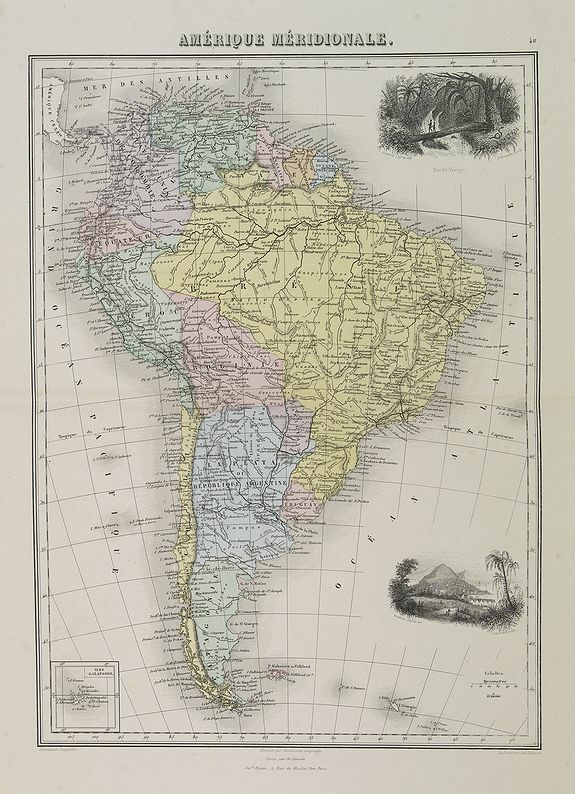 ¤ Large and detailed map of central part of South America. With inset maps of Chili and coast of Brazil, centered on Rio Janeiro. Lithography by J.Sulzer and printed by F.Barth. Border lines are drawn in by hand. The map is prepared by H.Kiepert and published in "H.Kiepert's Neuer Handatlas", published in Berlin by Dietrich Reimer. 186 MIGEON, J. Amérique Méridionale. Paris, 1874. Original colours. Steel engraving in mint condition. 365 x 270 mm. Je voudrais de plus amples renseignements sur le Lot N°27432 . 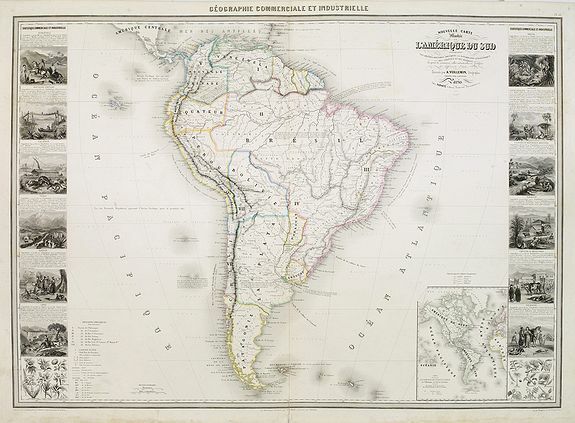 ¤ Decorative map of the South America from Géographie Universelle, Atlas Migeon. With an inset map of the Galapagos Islands. Published by J. Migeon. In upper right hand corner a view of the Saint Angu castle in Rome engraved by Smith. 187 COOK, Captain James. 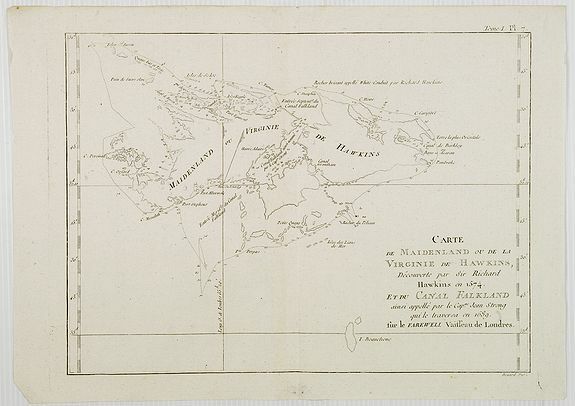 Carte de Maidenland ou de la Virginie de Hawkins, Découverte par Sir Richard Hawkins en 1574, et du Canal Falkland . . . [Tome I Pl.7.] Paris, 1774. Uncoloured. Center fold as issued. Good condition. 217 x 292 mm. Je voudrais de plus amples renseignements sur le Lot N°25892 . 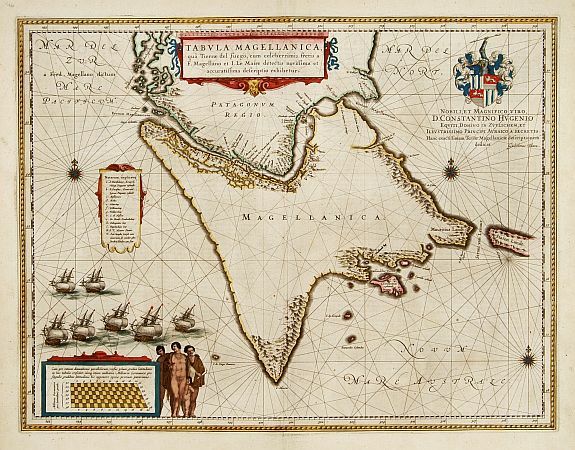 ¤ Chart shows the Falkland Islands and the Falkland Straits discovered by Sir Richard Hawkins in 1574. Shows many harbors, channels, capes, bays, shoals, islands, rocks, soundings and ships tracks circumnavigating the islands. 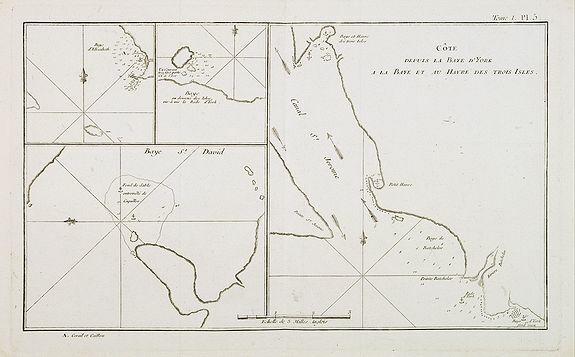 This print is taken from the first French edition of James Cook's first voyage entitled Relation des voyages entrepris par ordre de sa Majesté Britannique actuellement régnante pour faire des découvertes dans l'hémisphère méridional, et successivement exécutés par le commodore Byron, le capitaine Carteret, le capitaine Wallis et le capitaine Cook dans les vaisseaux "le Dauphin ", "le Swallow" and "l'Endeavour". An Account of the voyages undertaken by the order of His Present Majesty for making discoveries in the southern hemisphere, and successively performed by Commodore Byron, Captain Wallis, Captain Carteret and Captain Cook, in the Dolphin, the Swallow, and the Endeavour , the first official three-volume account of James Cook's first voyage, was edited by John Hawkesworth in English in London in 1773. The first volume contains accounts of the voyages of Byron, Wallis, and Carteret. The second and third volumes are entirely concerned with Cook's voyage, based upon material drawn from journals kept by Cook and the papers of Joseph Banks. Hawkesworth composed his account in the first person of Cook and incorporated Banks's descriptions and observations as well as his own commentary, without ever distinguishing the different sources. In addition to the written account of the voyage, the two volumes related to Cook's voyage include 31 illustrations, charts and maps. Captain James Cook, explorer, cartographer and hydrographer went to command several notable voyages, the first was from 1768-1771. He was led to his commission by the direction of British overseas exploration in 1766 as commander of HM Bark Endeavour for the first of three Pacific voyages. Cook later mapped the complete New Zealand coastline, making only some minor errors. He then sailed west, reaching the south-eastern coast of the Australian continent on 19 April 1770, and in doing so his expedition became the first recorded Europeans to have encountered its eastern coastline. 188 DONCKER, H. Pascaerte van Brazil en NieuNederlandt van Cuorvo en Flores Amsterdam, 1658. Beau col. d'époque. Paper slightly age-toned. Contemporarily laid down on paper. Very fine. 549 x 633 mm. Je voudrais de plus amples renseignements sur le Lot N°4984 . ¤ Rare chart of the Atlantic Ocean, from the first edition of Hendrick Doncker's Zee-Atlas, of which no surviving example is known. Although the idea of it's unusual coverage is derived from the Theunis Jacobsz chart of 1650, Doncker here introduces independent cartography. Most obvious is the difference in depiction of the rivers, for example the Amazon. The coast of Newfoundland and the New Netherlands also differ. "Gebroken lant" is introduced to name Long Island. No mention is made of the English presence in New England, the entire territory being named "Nieu Nederlant". In 1672 he introduced another similar plate, and later made use of a revised Colom plate. - Burden, America 338, state 1. 189 MALLET, A.M. Bresil. Paris, 1683. Uncoloured. Some very minor marginal age-toning of paper. Minor shine through of the French text on verso, hardly noticeable. Good condition and imprint. 145 x 102 mm. Je voudrais de plus amples renseignements sur le Lot N°22564 . 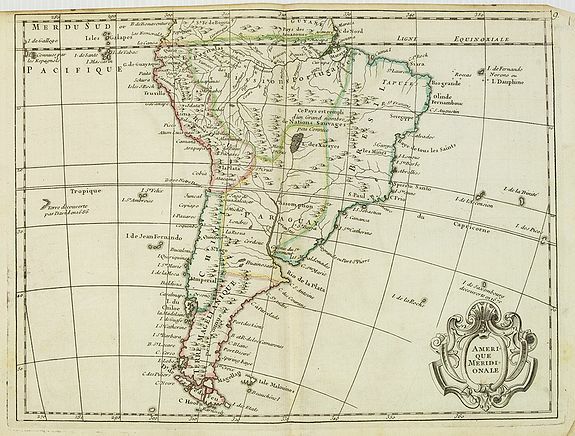 ¤ Interesting early map of Brazil. The wild inland as for example, the later state of Mato grosso, still unexplored. The eastern border of Brazil is called Terre Inconnue. From the French text edition of "Description d'Univers.." By Allain Manneson Mallet (1630-1706), a well travelled military engineer and geographer who worked in 17th century France under King Louis XIV. 190 DE FER, N. / DANET, G. Le Bresil.. Paris, 1719. Limites en col. d'époque. Wide margins, good impression. Printers crease next to lower part centerfold. 414 x 533 mm. Je voudrais de plus amples renseignements sur le Lot N°11101 . 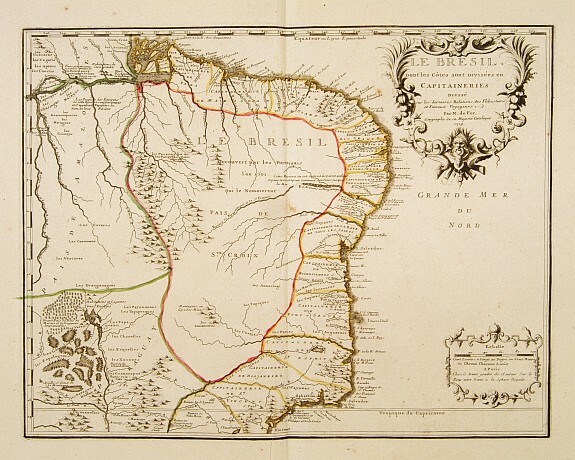 ¤ Uncommon issue of this fine map of Brazil prepared by Nicolas de Fer, issued by Guillaume Danet. 191 ANONYMOUS Fernando De Noronho. 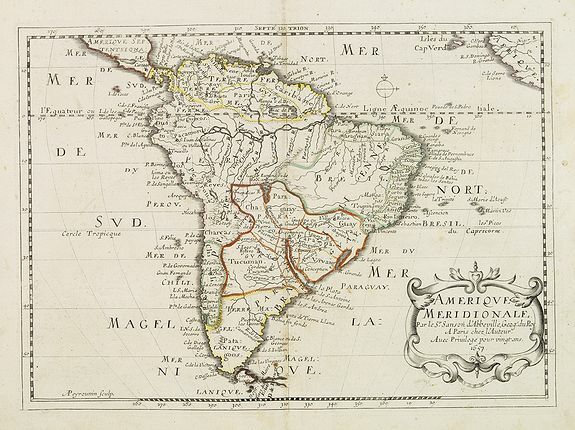 [Fernando de Noronha] Brazil c.1750. Col. d'époque. Paper very slightly age-toned. Pen and ink on paper. 300 x 460 mm. Je voudrais de plus amples renseignements sur le Lot N°21209 . 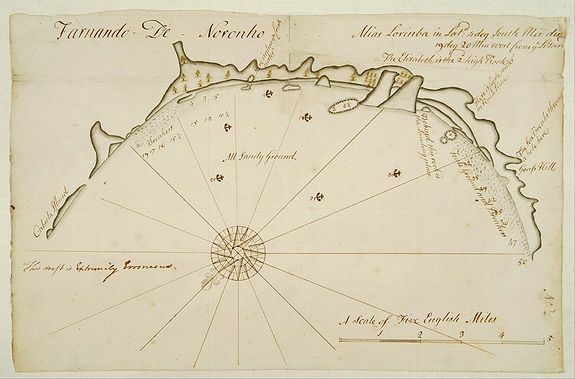 ¤ English manuscript map on paper of a bay on Fernando de Noronha. Many names in English, to the lower left This draft is extremely Erroneous. Fernando de Noronha is an archipelago in the Atlantic Ocean, midway from South America to Africa, around 220 miles (354 km) away from the Brazilian coast. It is a special municipality (distrito estatal) of the Brazilian state of Pernambuco. A rare example of a manuscript sea chart, probably from the Thames School, with intriguing early annotations, perhaps used in the offices of the British Navy. 192 DÉPOT DE LA MARINE Plan de la Baie de Rio-Janeiro… Paris  1843. Marginal light water staining along left border. Overall good condition. 885 x 595 mm. Je voudrais de plus amples renseignements sur le Lot N°23500 . ¤ A detailed chart of the Rio de Janeiro bay with towns, buildings, banks, isles and soundings made in brasses a French measure of depth of water corresponding to the fathom. With 2 insets respectively listing information about the soundings with a table allowing the convertion from brasses to metres and the corrections made in 1843. Engraved by Caplin after the original design of M. Barral, Naval Vessel Lieutenant under the command of the rear-admiral M. le Baron Hyde de Neuville. Paris 1829, corrections to 1843. With reseller sticker under lower border frame indicating that the map was on sale at the shop of the brothers Fillastre, Fossés du Chapeau-Rouge, n° 4, près la Bourse, Bordeaux. Reseller's stamp in the lower left corner. 193 COOK, Captain James. Cap Providence avec la Baye et les mouillages . . . / Anse St. David / Baye de l'Isle / Havre Swallow / Baye Puzzling / Baye du Cap Upright / Baye Dauphina. Tome I Pl. 4. Paris, 1774. Uncoloured. Center fold as issued. Some discolouration in lower part center fold. Good condition. 203 x 355 mm. Je voudrais de plus amples renseignements sur le Lot N°25890 . ¤ Eight charts on one sheet of Cap Providence, St. David's Cove, the Bay of the Island, Swallow's Haven, Puzzling Bay, Baye du Cape Upright 's Bay, Dauphina's Bay . 194 COOK, Captain James. Côte depuis la Baye d'York a la Baye et au Havre des Trois Isles / Baye St. David / Baye d'Elizabeth et la Baye en dessous des Isles. Tome I Pl. 5. Paris, 1774. Uncoloured. Center fold as issued. Good condition. 207 x 343 mm. Je voudrais de plus amples renseignements sur le Lot N°25891 . 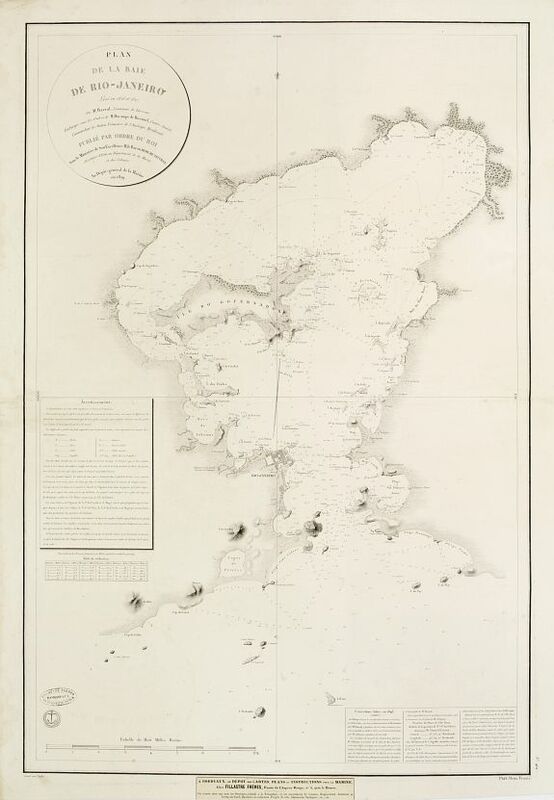 ¤ Charts of York's Bay, Haven of the Three Islands, St. David's Bay, and Elizabeth's Bay. 195 DU VAL, P. Coste de Guayane autrement Franc Equinoctale en la Terre-Ferme d'Amerique suivant les Dernières Relations . . . Paris, s.d., ca. 1677. Limites en col. d'époque. Trace de pliure médiane. Grandes marges.- In good condition. Good and dark impression. Wide margins. 261 x 338 mm. Je voudrais de plus amples renseignements sur le Lot N°31675 . 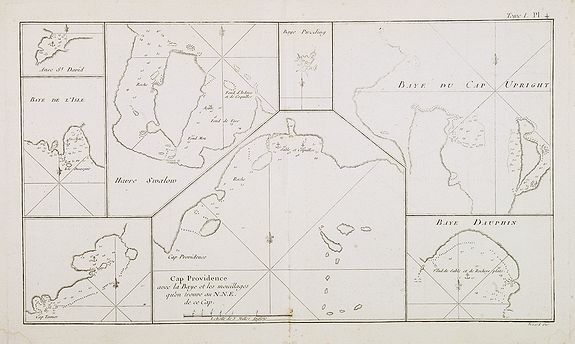 ¤ Carte figurant la Guyane et Cayenne ornée en haut à droite d'un carton représentant l'"Isle Cayene", gravée par Lapointe. Publiée dans l'une des éditions de l'atlas de Duval intitulé : "Cartes de géographie les plus nouvelles…". La carte n'est pas datée. 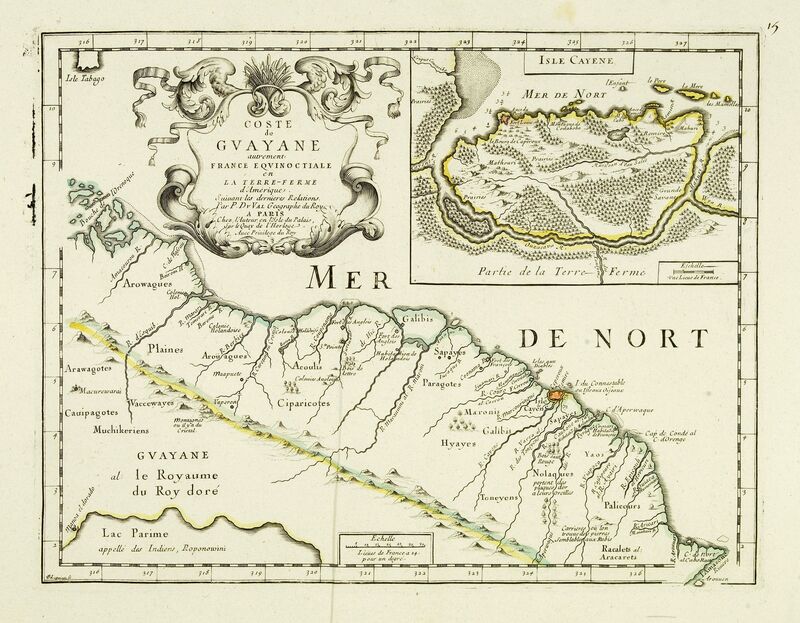 Uncommon map of the French colony Guyana in southern American Guyana, with a detailed enlargement of Cayenne in the upper right corner ( 155X110mm. ), with fine title cartouche upper left. 196 BLAEU, J. Tabula Magellanica. Amsterdam, 1660. Beau col. ancien. In very good condition. 412 x 535 mm. Je voudrais de plus amples renseignements sur le Lot N°4455 . 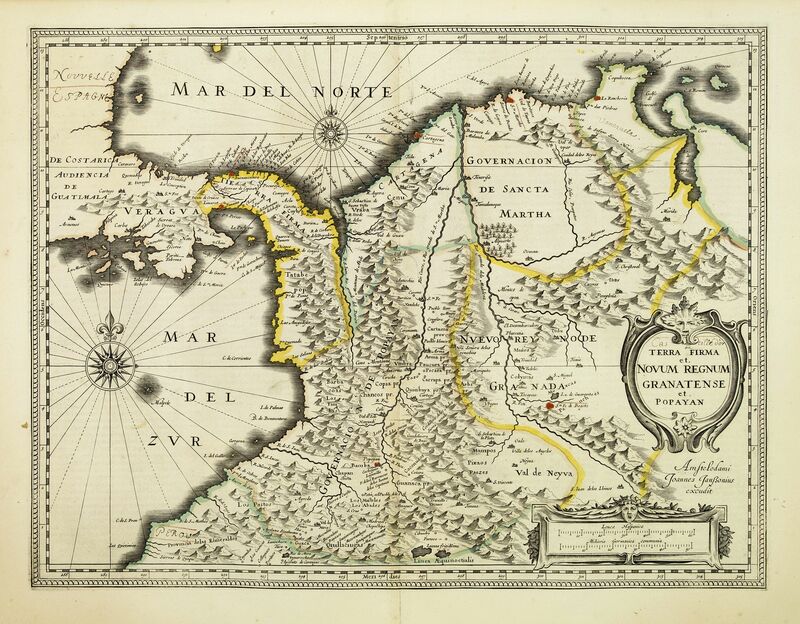 ¤ A map with Willem Blaeu's signature, but published by his son Joan, of South America's extremity with the Strait of Magellan and Le Maire Strait. The coastlines are depicted as very mountainous, while the interior is completely without detail. Richly arrayed with rhumb lines, three compass roses, a fleet of ships, and the coat of arms and dedication to Constantino Hugenio. Three strapwork cartouches with title, key and scale featuring a family group of natives. 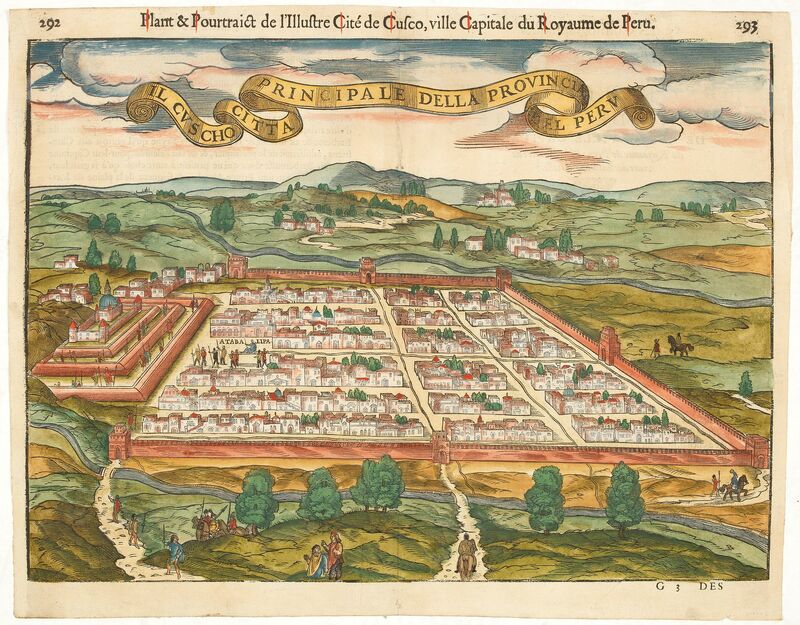 197 DU PINET, A. Il Cuscho citta principale della provincia del Peru. Lyons, 1564. Coloured. Wood block print with letter press. Centerfold on verso reinforced for protective reason. Fine. 270 x 378 mm. Je voudrais de plus amples renseignements sur le Lot N°33500 . 198 SANSON, N. Terre Ferme, Nouveau Royaume de Grenade, & C. . . Paris, P. Mariette, 1667. In original o/l colours. Paper slightly age toned. Some marginal water staining and spotting. 205 x 277 mm. Je voudrais de plus amples renseignements sur le Lot N°25204 . 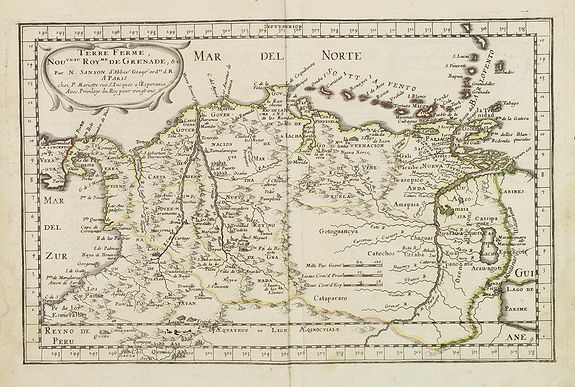 ¤ Map depicting Colombia and Venezuela prepared by N.Sanson and published by Pierre Mariette. Published in an early edition of the small Sanson atlas L'Europe Dediée a Monseigneur . . . Le Tellier Secret. D'Estat &c."The atlas proved popular and the maps were imitated by Johann Zunners in Frankfurt (1679) and by Joannes Ribbius and François Halma (1682-1730s). The map offered here is the first plate with the address of Pierre Mariette, but with the date removed. Engraved by A.Peyrounin.